I just saw that ChemDoodle 9.0 has been released and I plan to have a detailed look later this month. 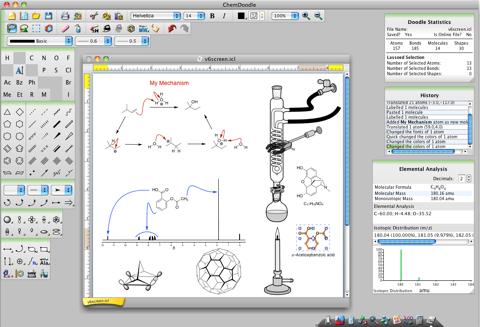 ChemDoodle 9 is a major revision of every aspect of the software. We spent over 2 years overhauling and improving the cheminformatics engine, interface, drawing controls, image and chemical file types, graphics, and operating system compatibility. In addition to the new features, the entire codebase has been refactored for the current best standards to take advantage of the latest performance, memory and security features of the operating system. Drawing and Graphics – Tons of new systems for making your graphics quicker. Auto-placement of attributes (charges/radicals/stereocenters/etc.). An improved text tool that can create both atom text and formatted captions. Draw chiral carbon nanotubes in addition to zigzag and armchair. New dynamic brackets and structure highlights. Better drawing tools for advanced figures. Chemistry – State-of-the-art implementation of the most recent CIP rules. A clearer and more powerful warning system. Advanced implicit hydrogen handling including the analysis of advanced aromatic resonance systems. Full support for the latest elements as defined by IUPAC and much more! Interface – A brand new customizable cursor system, improved IUPAC name-to-structure interface. Improved color palettes, now with Rasmol, CPK and Custom color sets. HTTPS support for PubChem is now implemented for access in MolGrabber. Improved color choosers including alpha support and high resolution improvements across the entire application. Chemical Files – The Nature style sheet has been added. SMILES interpretation has seen significant work, with a focus on very advanced cheminformatics techniques. Added support for the RCSB MacroMolecular Transmission Format (MMTF). More support for ChemDraw, MDL CT, MRV and ISIS/Sketch files. Images – TIFF images can now be exported with custom DPI settings. GIF image output can now have semi-transparent pixels merged with white. Added viewBox attribute for SVG. When saving files, you can now use alternate extensions and other image file chooser improvements. Control which image file types are shown in the save image choosers. Vector Art – New glassware graphics have been added as well as dozens of new BioArt. Customizability – The keyboard and tools shortcuts are now fully customizable by the user. The user settings folder location can now be controlled. * Custom attribute names and values are now persisted through restarts. Windows – Full support for high-DPI screens, without the manual scaling required in the past. The OLE plugin has been rebuilt for the most current compliance with Windows libraries. macOS – Improved and full Retina support. Native file choosers. PolyPharma Poly-pharmacology of molecular structures: use structure activity relationships to view predicted activities against biological targets, physical properties, and off-targets to avoid. Calculations are done using Bayesian models and other kinds of calculations that are performed on the device. Green Lab Notebook allows recording of multistep chemical reactions, using molecular structure, name and stoichiometry as the primary components. When quantities are provided, interconversions are calculated automatically, and green chemistry metrics are shown. SAR Table app is designed for creating tables containing a series of related structures, their activity/property data, and associated text. Structures are represented by scaffolds and substituents, which are combined together to automatically generate a construct molecule. The table editor has many convenience features and data checking cues to make the data entry process as efficient as possible. 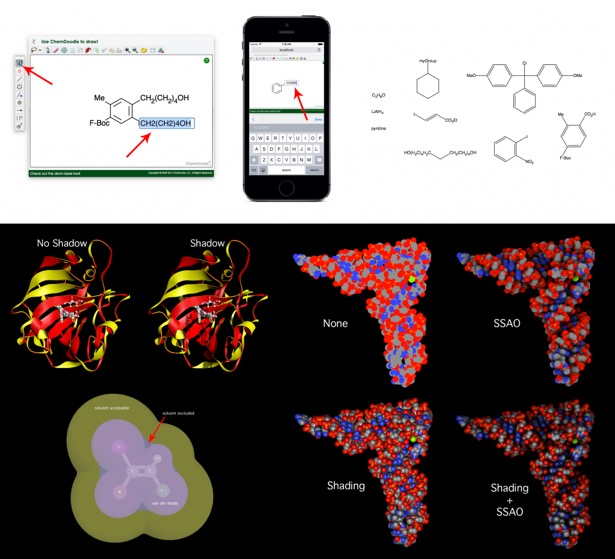 MolPrime is a chemical structure drawing tool based on the unique sketcher from the Mobile Molecular DataSheet (MMDS). Approved Drugs app contains over a thousand chemical structures and names of small molecule drugs approved by the US Food & Drug Administration (FDA). Structures and names can be browsed in a list, searched by name, filtered by structural features, and ranked by similarity to a user-drawn structure. The detail view allows viewing of a 3D conformation as well as tautomers. Structures can be exported in a variety of ways, e.g. email, twitter, clipboard. Green Solvents reference card for chemical solvents, with data regarding their "greenness": safety, health and environmental effects. 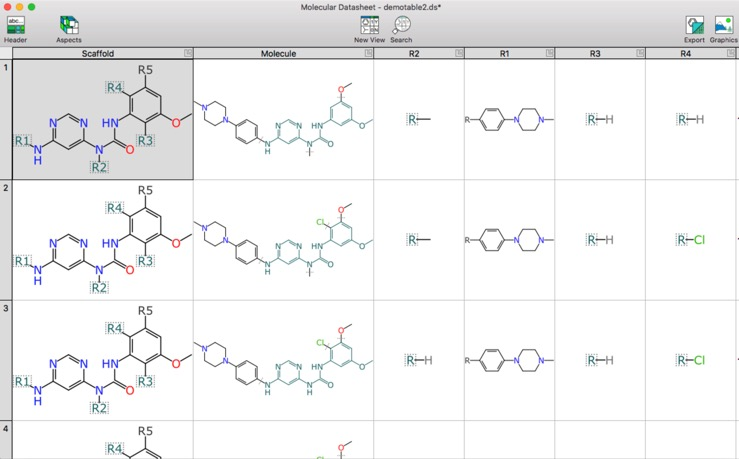 For the desktop the OS X Molecular DataSheet (XMDS) is an interactive cheminformatics tool for viewing and editing molecular structures, chemical reactions and data. It is designed to be instantly intuitive to anyone who has used a Mac, a spreadsheet and any chemical structure sketcher. The OS X Molecular DataSheet (XMDS) is an interactive cheminformatics tool for viewing and editing molecular structures, chemical reactions and data. It is designed to be instantly intuitive to anyone who has used a Mac, a spreadsheet and any chemical structure sketcher. Its primary functionality is to provide a chemically aware spreadsheet editor: it operates on a grid of editable cells, made up of typed columns, that can be molecules, numbers or plain text, it also includes a chemical drawing app. This is a significant foray into the desktop space for Molecular Materials Informatics who are best known for their excellent suite of tools for iOS, which includes the mobile SAR Table app and the Mobile Molecular Datasheet. Although there are a number of ways that chemical structures can be drawn based on individual preferences, our journals aim to use consistent styling wherever possible. iChemLabs announced the release of version 8 of the ChemDoodle Web Components, the largest update of the library to date. The ChemDoodle Web Components is an industry leading HTML5 toolkit for building scientific applications for web and mobile platforms. The ChemDoodle Web Components are licensed under the open source GPLv3 license or under a commercial license. Executive Summary: Version 8 is the largest update to the ChemDoodle Web Components library to date. The sketcher has seen significant work, with new drawing tools (rings, chains, templates, atom label tool, more). Condensed labels with abbreviations are now supported, for advanced chemistry. New 2D shapes include dynamic brackets, atom mappings and variable attachment points, while molecular surfaces (vdW, SAS, Connolly) can now be generated and rendered in 3D components. The shader system used by the 3D components has been dramatically improved for much faster performance (and new improvements added like gamma correction) and a deferred shader has been implemented to provide advanced graphics techniques like outlining, software antialiasing and screen space ambient occlusion. Shadows can now be rendered in 3D scenes. The entire website has also been improved, with new advanced tutorials for working with the sketcher to listen to user changes, or show off an advanced in browser sketcher interface that mimics the desktop software, for instance. SVG can now be exported from the ChemDoodle Web Components in addition to PNG. A new iChemLabs Cloud service allows developers to match entire mechanisms for educational eBooks and advanced reaction databases. There is a lot in this update, please see the links below for more information. The sketcher has been significantly developed. A new requireStartingAtom option allows you to disable to starting atom requirement while sketching. A new resizable option enables the user to resize the sketcher canvas. A new floatDrawTools option uses a floating toolbar for the drawing tools, just like the desktop software. Several new tools have been added, including an arbitrary ring size and arbitrary chain size tool. An atom label tool has been added with a text input field (like in the desktop software) to enter custom atom labels, including advanced condensed labels; space will open the text field by keyboard while the return or enter key will close it or repeat the last typed label for a hovered atom. Templates can now be added in the same manner as the desktop software using the new Templates widget; you can modify and add to the template library. The MolGrabber widget now allows the loading of any content (multiple molecules and shapes) and will insert the content in its entirety to the canvas. The MolGrabber widget will now also alert you if you press the Load button before the Show button. New buttons are available for centering the content in the sketcher as well as for horizontal and vertical flipping. The Open dialog now slides down from the toolbar as a Popover. The lasso tool and selections now use a dashed line just like in the desktop software. When using the labels tools in the sketcher, the periodic table canvas now selects oxygen by default and will revert back to label mode of the currently selected element if chosen from the toolbar. Silicon has been added to the default labels group. Placing unsaturated rings (like benzene) now better lay out double bonds to avoid overvalencing atoms. Hovering bonds are now more responsive, especially for elongated bonds. Pushers now can be set by clicking and then clicking again, no drag necessary. A new UIs component has been added, called Popover. A Popover is modal and can slide in from other components or appear in its own component for user input. Added mobile support for the UIs interface elements. For example, previously dialogs couldnt be moved on mobile devices, now they can. Complex labels can now be handled, with the required additional tools for parsing, formatting and rendering. With this feature, your chemical structures can contain advanced chemical labels consisting of element symbols, abbreviations (a dictionary controlled by you) and numbers and parenthesis for multiplicities. The labels are automatically formatted chemically and oriented based on least interference with surrounding bonds. Some examples include COOH, CO2Me, N3, CH2(CH2)4OH, C3H7O, Tosyl, myAbbreviation, and more. Use this to create concise publication quality figures directly in your websites. Added a wavy bond type. New shapes have been included. New 2D shapes include dynamic brackets for repeating groups, atom mappings for reactions and variable attachment points (VAPs). New 3D shapes include molecular surfaces. The ChemDoodle JSON specification has been updated to support these shapes. Molecular surfaces can now be generated and rendered for sets of atoms in 3D. Supported types include van der Waals, solvent accessible and solvent excluded (also known as a Connolly surface). You can control resolutions for all and the probe radius for solvent based surfaces. Rendering styles include Dots, Mesh and Solid and all colors, transparency, etc. can be controlled through visual specifications. The shader system for the 3D components has been redone. Several improvements in the Phong shader allow us to render higher quality graphics with lower quality meshes, leading to significant performance improvements across the entire 3D ChemDoodle Web Components. A deferred shader system has been developed allowing the implementation of advanced shader procedures for generating graphics. Currently implemented are outlining, screen space ambient occlusion (SSAO) and software antialiasing (FXAA). SSAO in particular is very powerful as it allows us to simulate how much ambient light is accessible to objects in crowded spaces, allowing us to shade the scene in a more accurate manner. This works on all geometries, but the feature can really be shown off in space filling all-atom models of large macromolecules. Shadows can now be rendered in 3D scenes. You can control the intensity of the shadows with the shadowintensity3D visual specification. Gamma correction has been implemented for brighter, more color accurate rendering controlled by the gammaCorrection_3D visual specification. The VisualSpecifications class now provides a copy() function for creating style sheet copies. Added a new bond visual specification for absolute saturation widths: bondsuseAbsoluteSaturationWidths2D. Bonds now split colors based on their substituent atom colors, with the bondssplitColor visual specification. The bondsuseJMOLColors and bonds_usePYMOLColors specifications have been removed. Use the corresponding atom specifications instead. Made wedge width an absolute value in line with desktop software with a default value of 6. Components now center 2D content much more pleasantly by calculating bounds of atom labels in addition to coordinates and using a constant internal padding. The preview, hover, select and error colors are now controlled by visual specifications. A new iChemLabs Cloud call, mechanismMatch(), is now provided to match mechanisms. You can see it in action here. Updated van der Waals radii data. Added the rest of the new elements as defined by IUPAC. Updated the library to use some newer standardized HTML5 functions, removing the polyfills from the ChemDoodle.extensions package. The PNG package has been refactored to provide both an open() function for loading the PNG into a new window and a string() method for creating a string object of the PNG content. A new SVG package has been added to create Scalable Vector Graphics data from the ChemDoodle Web Components, similar to the PNG package for bitmap graphics. Minor graphical improvements for the UIs decorations. Updated jQuery to version 2.2.4. Updated jQuery mousewheel to version 3.1.13. Updated the entire website. Added more advanced tutorials: Image Export, Initializing Components after Closing the DOM, Sketcher: Application Window, Sketcher: Listening to User Changes. Full details of the update https://web.chemdoodle.com/installation/changelog/. As highlighted recently SketchEl2 a chemical drawing package is now open source. The SketchEl 2 project is underway as a desktop app, based on web technology and delivered as an Electron package. The GitHub repository is now public, on account of there being enough functionality to be arguably useful. This is a very early release, so do be ready to give some useful feedback if you feel so inclined to try it out. With withdrawal of ChemDraw and Chem3D from iOS I thought it might be of interest to highlight some of the alternatives. A new chemical drawing app SketchEl2 has been released. It is based on the an original java app but as the author notes. Although a few holdouts may disagree, Java is not the platform of the future for the desktop (that ship sailed a long time ago). So the new version SketchEl2 is now a web runtime app built using the Electron Framework) and Node.js and the Chromium web browser. I am glad to announce the release of OSRA 2.1.0. OSRA (Optical Structure Recognition Application) is a tool for converting images of molecules into SDF, SMILES and many other chemical formats. Images can be pictures of single molecules or complete PDF documents with multiple pages of text and graphics. In addition to molecules OSRA can also recognize reactions, and, starting with this version, simple polymers. The improvements in this version: - Significantly improved recognition of PDF documents, no longer dependent on Ghostscript at runtime. - Recognition of polymers (different approach from POSRA - a separate tool focused on polymer recognition). Please note that if you are building from source the dependencies have changed. OSRA now requires poppler (version 0.41) to process PDF files and a custom-patched version of OpenBabel to save polymer MOL and SDF files. The patched version of OpenBabel is provided at the above url. OSRA no longer requires Ghostscript to be installed. ChemDraw 16 for Mac is 6x faster than previous versions and includes features such as: auto-save and versioning, an improved UI, Unicode support, Improved text rendering including for subscript characters and atom labels. What’s more, ChemDraw 16 for Mac offers improved multi-monitor and Retina (high DPI) display support. Initial comments suggest round-trip editing is now supported. No mention of Pages, Keynote, Open Office. 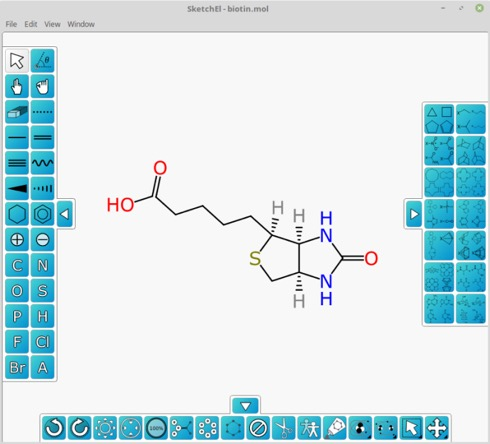 A new update for the very popular chemical drawing application ChemDoodle has been released. Version 8.1 looks to be a significant update with several useful new features and a few bug fixes. New bitmap colorspace output options: Color, Greyscale, Monochrome. The images are not just in the colorspace, but the image data is correctly defined, so that monochrome images are much smaller than grayscale, which will be smaller than color. Added Functions setting to use either the Bondi or current literature value for the van der Waals radius in the VABC calculator. Added support for implicit hydrogen overrides to all capable formats. Added some more recent elemental data. Updated and expanded vdW values. Added the latest new element names from IUPAC, completing the last row. Alpha colors are now stored in ChemDoodle Documents. Chain tool now merges with previous drawn structures in the same manner as rings and templates. Red rings will be shown for auto-connect overlaps and this behvior can be controlled in General Preferences. All issues involving drawing chains on top of previous structures have been resolved. Auto-connect range when drawing rings, chains and templates is now controllable in General Preferences. Added option to suppress implicit hydrogens from groups 1-12. Functional hydrogen settings have been moved from Atom Visuals Preferences to Functions Preferences. Added more refined options for controlling double bond symmetry. Now terminal double bonds connected to a ring can be made symetrical as a case. OPSIN warnings now still produce a result and display an appropriate warning instead of failing. Keyboard shortcuts have been added for the atom label tool, so you can bold, italicize and underline text via the keyboard. Added HTTPS support for NIH Cactus, returning functionality to the 3D clean tool. Corrected Elemental Analysis and Mass Parent Peak simulation results for structures with multiple charges. Addressed a number of issues for implicit hydrogen calculations in resonance systems. Fixed issue where arbitrary rings and and crown ethers drawn to a bond of length that was different from the standard length didn’t work properly. Fixed bug where Preferences boolean button sets were flagging visuals changes for non-visual settings. Fixed incorrect behavior where General or Advanced Preferences settings were falsely notifying the user of style sheet changes. Fixed issue where output ChemDoodle 3D Scene (ic3) files from ChemDoodle were flipped on the y-axis. Corrected a number of minor graphical glitches with vertical connections and wedge/bold bonds. Closing the color select window no longer conforms colors, but does update the color button. Using the color scrubber of the Quick Colors button now also sets the selection to that color after choosing. Quick Colors button now correctly adjusts an entire label, even if chemical interpretation is off. Minor updates to the Periodic Table. The Center>Selection menu items are now correctly context sensitive. iChemLabs extensions to JCAMP DX files have been removed and are no longer necessary. Note that older JCAMP spectra written from ChemDoodle that used these extensions (typically simulation output) will not be able to be read anymore. Fixed rare crash that occured when Preferences bounds somehow ended up out of the defined bounds. Fixed some minor IUPAC naming issues. Isotopes from ChemDraw files are now displayed correctly. Isotope labels are now correctly accounted for in bond retraction. Ring, chain and template actions that don’t actually change the document are now ignored in history. Minor text sizing considerations and corrections. Kekulizer now ignores zero order bonds. Improved text layout in tabs not to overlap with close buttons. Restoring the document now correctly updates the History widget. Restoring the document now correctly clears the selection if there is one defined. Fixed issue where loading an autosave didn’t correctly enable the Restore menu item. Fixed issue where dialogs were not reappearing after being deiconified. Carbon labels will now be displayed in the implicit hydrogen count is overridden to 0. Fixed the Login window cutoff. Completely uppercase element symbols are now correctly handled when reading in MDL CT files. ChemDoodle 8.0.1 is now available. ChemDoodle 8.0.1 is now available. However, automatic update is not allowed for Mac OS X. You must manually update ChemDoodle by downloading the latest version of ChemDoodle from www.chemdoodle.com, and re-installing it. NOTE: You must close ChemDoodle before re-installing the new version. This is a minor update fixing issues brought to our attention since the ChemDoodle 8 launch. For changes to version 8, scroll down. Periodic table should now open again from the View menu. Fixed the interpretation of deuterium and tritium in complex condensed labels. Charges in left oriented labels are now located in better positions. Default cyclopentadiene and cycloheptatriene tools now place saturation on the sprout point unless not chemically feasible. Adding rings and templates will no longer merge multiple atoms into a single point if multiple adding atoms are within the merging distance of a present atom. Fixed rendering of Bold and Thin double bonds when in perspective merges. Added feature to lock polyline drawing to the horizontal and vertical positions if the shift key is held down. Flipping while retaining stereochemistry now accounts for meso centers. Torsion bond function now preserves stereochemistry if set to do so by the option under the Functions tab in Preferences. Search widget will no longer execute a search when the drop panel is empty. Fixed issue where single atom results were not rendered in the Search widget. Search widget results are now sorted with hits appearing first. Search widget searches with stereochemistry defined in query structures now work properly. Fixed bug where the Search widget could not be manually stopped. Fixed bug where query labels would disappear in the document after being dropped in the Search widget. Fixed minor SKC import issues with text labels. ChemDoodle 8 is a massive update to ChemDoodle. Included are hundreds of new features and improvements, recommended to us by users like you. Enjoy and please spread the word! The graphics system has been improved even beyond current industry standards for graphics. Every bond merge and pixel was scrutinized. Chemical structures have never looked better. ChemDoodle provides the best graphics in chemistry, everything else is a waste of money. Major IUPAC naming improvements, including very advanced ring systems. Full support for Retina display Macs and support for high-DPI Windows hardware. A new query structure system for defining sets of molecules and for searching partner services. New powerful tools for drawing arbitrary rings and crown ethers to atoms and bonds. Superscript and subscript merging to easily create atomic notations and other chemical text. More specific cleaning tool for adjusting only a selection of a structure. Text output options and improvements for EPS and SVG files in addition to PDF. A dramatically improved Templates widget with new and more aesthetic templates. Read in NTUPLES (multiple spectra) from JCAMP files. Added support for both the SketchEl (el) and Crystallographic Information Format (cif) filetypes. More support for working with the ChemDoodle Web Components. Dozens of new BioArt graphics. Performance improvements for faster work. Dozens more new features: two new bond types, implicit hydrogen control, automatic IUPAC locant labelling, vastly improved condensed labels, search files based on query structures, recursive SMARTS, metric support for document aids and rulers, a new precise form for scaling a specific bond, many interface improvements and so much more. The increasingly popular chemical drawing package ChemDoodle has been updated, this is a major update to an already excellent application. There also looks to be offers at the moment so this is a great time to purchase. At long last ChemDraw for Mac has been updated. The latest version now supports Mac OS X 10.10 (Yosemite) and supports the retina display. Whereas in the past we had Std, Pro and Ultra we now have Prime and Professional and cross grades are available. The ability to search SciFinder is now available in ChemDraw Professional Mac version, and the only differences are lack of OLE editing, and the absence of the pKa LogP LogS calculations. I just thought I'd like to thank all those who contributed to the Scientific Applications under Yosemite web page, many users and developers contacted me either via email or in the comments section and they certainly added information about applications that I don't have access to. To date the page has been viewed well over 10,000 times with readers from 188 different countries. Viewers spent an average of just under two minutes on the page and it still attracts 800 pages views a month. Given that 75% of the visitors to the site are now using Yosemite I suspect most scientists have now made the transition and I won't be updating the page any more. Once again thanks for the contributions. Office for Mac Preview is the open beta version of the upcoming version of Office 2016. One of the issues that crops up everytime there is an update is round-trip editing, i.e. the ability to copy and paste from a chemical drawing package into Word for example and then be able to copy and paste the structure back from Word into the chemical drawing application. I've not tested it myself but I am assured that ChemDoodle behaves as expected. If anyone has tested any other chemical drawing packages please let me know. 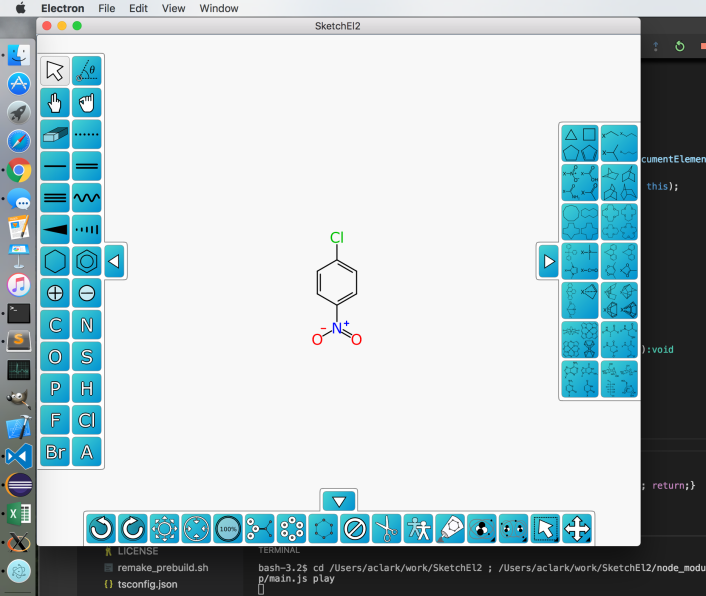 iChemLabs have just announced an update to ChemDoodle Web Components. This is a major update to the ChemDoodle Web Components with new additions to the 3D features, most notably Pipe and Plank models for proteins and support for high DPI displays, such as the Apple Retina display. ChemDoodle 7, released in September, continues to receive great reviews and an ever increasing userbase in over 80 countries. We are working hard on many new features and continue to improve the massive number of features already available. We want to let you know that introductory pricing ends on December 31st, 2014. If you have friends or colleagues who are considering purchasing ChemDoodle, please tell them to purchase by the end of this year to take advantage of these low prices, and save as much as 50% off the regular price. There is a review of ChemDoodle here. ChemDoodle is now firmly established as one of the key chemical drawing packages that offers an inexpensive alternative to some of the increasingly expensive drawing packages. It also has the advantage in that it supports Mac, Linux and Windows and offers access to ChemDoodle Web Components. I’ve written a review of the latest update. The latest update to the hugely popular chemical drawing package ChemDoodle has just been announced. I hope to write a review later this week. ChemAxon have just announced the release of version 6.3. This release includes several new features including the ability to draw and analyze complex patent Markush structures, display Markush hierarchy, work with R-Groups and enumerate Markush structures. A new Solubility Predictor, the aqueous solubility predictor is based on the topology of the input molecules, but also calculates the pH dependence and the solubility at a desired pH level. IUPAC name conversion supports now Japanese names as well as the existing English and Chinese names even if mixed in the same document so you can extract all the chemistry from documents in these languages. There are also updates for Marvin JS 6.3, Standardizer & Structure Checker 6.3, Instant JChem 6.3, and Compound Registration 6.3. The excellent ChemDoodle Web Components have been updated. WebGL based components now work in IE11. iChemLabs Cloud services now work based on a queue, so all requests will proceed in the order requested, and you will no longer see a message to wait for the previous request to finish. Added a iChemLabs.useHTTPS() function for websites that want only to use HTTPS. Optimize zone now provides better placement when drawing triple bonds or higher. Optimize zone now avoids placing substituents inside of rings. Removed code calling jQuery.browser which was removed in jQuery 1.9. This code is only helpful for detecting when to use Google Chrome Frame. Note that Google Chrome Frame support (and therefore support in IE6-8) will be removed soon. Fixed issue where clicking on the help button in some browsers would lock the component into a drag gesture. Fixed bug where rendering atoms in 2D surrounded with a circle would error out. Picking in 3D is now object aware, and will exclude objects if not selectable. So picking atoms for measurements is now much more responsive. Fixed issue where measurements were not working in the Editor3D canvas on Android. Help button now works in the Editor3DCanvas on Android. Measurement values now render with a forward z-index of 1 Ångstrom to be placed on top of any objects in the immediate vacinity. Minor syntax and lexical fixes. ChemDoodle has been updated to version 6.0.1, this is a free update to fix a couple of bugs. A new EXE is built for Windows. This EXE will now use either the 64 bit or 32 bit JRE if available. If both are available, the new executable defaults to the 64 bit JRE. iChemLabs Updater has been updated to work in mixed Java environments on Mac OS X. Those with both Java 1.7 and 1.6 installed on Mac OS X will notice that ChemDoodle will not automatically open after the update. Ignore this, as this new updater corrects this issue. Fixed IUPAC naming issue where locants were not correct in ring blocks for stereocenters. Fixed IUPAC naming where a double dash could occur. Fixed bug where groups would not always resize all their contents. Fixed crash if non-recognized colors were present in ChemDoodle Documents. Colors in groups and reaction area text are now stored correctly in ChemDoodle Documents. Limited the size of files previewed by the Quicklook plugin to 200MB. ChemPencil is an inexpensive chemical drawing application that has all the usual chemical drawing tools. However as fas as I can tell it does not currently support round-trip editing, structures are pasted into documents as images and can not be then copy and pasted into ChemPencil for further editing. There has been an update to ChemEquate automatically formats and balances chemical equations. Copy with one click for use in word processing applications. Molecular weights are also conveniently provided. Dotmatics have just announced that the chemical drawing app Elemental for iOS has been downloaded 100,000 times. Whilst not in the same league as Angry Birds it surely marks an important milestone for scientific apps for mobile devices. Still waiting for an update? At the WWDC on June 10 2013 Apple announced the latest version of the Mac OSX operating system and on the following October 22 they announced it was available as a free instal from the Mac App Store. Since then there have been two updates leading to the current 10.9.2. As soon as the update was announced at the WWDC many software companies started checking and updating their software so that when Mac OSX 10.9 was released they had compatible updates available immediately or shortly after. I kept a list of scientific applications under Mavericks and have updated the list periodically. Most software is now compatible, or there are workarounds. However recently I was made aware of the situation with ChemBioDraw from Perkin-Elmer (formally Cambridgesoft). ChemBioDraw has been a major chemical drawing package on the Mac for as long as I care to remember however the current version is not compatible with Mavericks. Indeed when you look at the support forum there are reported issues with retina display dating back to 2012! A support topic that has been viewed nearly 6000 times but not yet fixed apparently. There are many comments of the support forum but perhaps this gives you a flavour. I confirm, the copy/paste issue in Mac version of ChemDraw 13 makes it totally unusable!!!! I suggest this is not only a problem with the compatibility with Mavericks. It never worked in Mountain Lion too! This issue is at least one year old and the developers just continue to ignore this issue. ChemDraw 13.0 crashes >90% of the time when you copy/paste a structure. As of writing there is no indication when there will be a fix or whether earlier versions of ChemBioDraw will also be updated. This software is very expensive $1140 for a one year license! So my question is what is a reasonable length of time to expect to wait for an update? Marvin 6.2 from chemAxon has been released. R-GROUP DISPLAY AND EDITING: In MarvinSketch editing and displaying R-groups were modified and improved in several cases. Bugfixes, Java Webstart did not run on Macintosh computers. After this you would not get the "damaged dmg" popup and you can install the downloaded dmg. After install it is probably a good idea to reset the Security settings. The latest update to the increasingly popular chemical drawing package ChemDoodle has just been released. 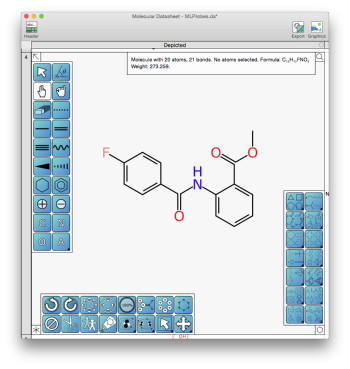 ChemDoodle 6 is the latest update from iChemLabs and once again it supports Mac, Linux and Windows and works with most document creation packages. This is apparently a free upgrade for those who recently purchased ChemDoodle 5. I plan to write a review of ChemDoodle 6 when I have time but looking at the release notes this looks to be a substantial update. IUPAC naming with over 20 options! Carbon nanotube and prism builders. Both zigzag and armchair nanotubes can be built. These tools quickly produce 3D geometries. Auto updating labels can now be attached to molecules, so they will update with IUPAC names, molecular formulas and more. Mac OS X Quick Look plugin. Easily preview all your chemical files in Finder just by pressing the space key. More Windows support, including a more powerful tool for supporting Windows filetype associations with the option to unassign types, support for the MDLCT and MDLSK clipboard formats for copying and pasting between a wider array of chemical applications, and greatly improved OLE support to allow for double-clicking to edit structures. More glassware, including a new organized glassware window. You can now also remove liquid from the templates. Significantly improved graphics. Graphics in ChemDoodle were already very good, but we took a look at all the graphics at very high scales and resolutions. We have made sure to focus on all the little details. Bond join edge cases have been improved. Hashes are now auto centered, making recessed bonds and dashed bonds look much nicer. Other bond types have been scrutinized for the best aesthetics. Convex hull algorithms have been built for better placement of bonds around labels. Cis double bonds will now prefer the inside edge. Circles over charges now only surround the number. Aromatic ring circles now meld to the shape of aromatic circles. Arrows look nicer. You won't find better graphics in any other application. A new 180° chain angle clean option for easily creating Lewis structures and figures with 90° angles. Complex embedded ring systems (like corannulene) now clean very well in 2D. Added resolution controls to the Elemental Analysis widget. An advanced formatted text system for the system clipboard. You can now copy and paste your molecular formulas, IUPAC names and others into word processing applications with formatting intact. Many other minor, but useful features: option for the delete key to decrement bonds, nominal mass counter, improvements to the TLC Plate widget, improvements to arc placement previews, alt and shift now modify attribute placement just like placing bonds, improved file chooser previews for data files, more templates for the Templates widget, and more. Squashing of dozens of bugs. Remember also that there are also ChemDoodle Mobile. Both ChemDraw and Chem3D have been updated, the release notes don’t give much information on the updates other than Redesigned for iOS7 and bug fixes. The use of mobile devices in teaching has offered new opportunities and a recent presentation by Layne Morsch illustrates this quite nicely. Using ChemDraw for iPad and Flick-to-Share to Increase Engagement in Organic Chemistry. The page has a couple of embedded videos that give more details. There was a blog entry on In the Pipeline about a bug in ChemDraw. Actually this has been known for a while (and present in previous versions) but it seems it still has not been fixed in the latest version of ChemBioDraw 13 on the Mac. As you can see in the image below including explicit hydrogens in your structure significantly impacts the calculated LogP. Whilst people don’t often add explicit atoms to phenyl rings, (expect perhaps in SAR studies) they often add them to heteroatoms. At the moment there is no bug fix and no date set for a fix to any version of ChemBioDraw, the only approach is to avoid adding explicit hydrogens to structures if you want to calculate LogP. I’ve looked at a number of other applications and there seem to be no issues with ChemDoodle, Elemental, Marvin or OpenBabel. ChemAxon have released a new update to Marvin. Bugfixes MarvinSketch GUI MSketchPane setPiece(Molecule) method did not work, it set the molecule on the canvas instead of putting it on the cursor. Import/Export CXSMILES/CXSMARTS CXSMARTS containing valence property information was recognized and read as SMARTS. SKC Some reaction was read as R-definition from SKC format. External structure checker configuration file URL can be set via Java System Property. MolInputStream and MolImporter could have different format options. MolImporter did not close its inputstream when an exception was thrown in the constructor. Molecule type property was allowed in SDF, CSSDF export. The coordinates of the sequence residue imported from SCSR MOL files were wrong if the residue had three attachment point. Graphical brackets were not imported from CDX files. Cleaning of position variation bonds could create overlapping bonds. Fixer options in MarvinSketch are updated with newly defined settings. External checkers can be loaded from JAR file in case the JAR file contains a space.